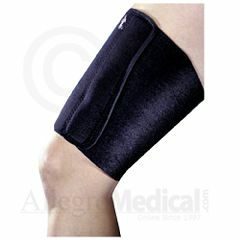 Provides moderate compression, support and warmth for groin, hamstring and quadricep injuries. Easy wraparound neoprene design. Fits 19”-28” (48cm-71cm) thighs. Sturdy. good value for the price..
apple logo not liked by u.
I gave this to my granddaughter who had a pulled muscle and it gave extra support during sports. Easy to apply! I believe that this product would have worked if it was made larger. I fell and broke my right femur just below the ball &amp; socket. Had a rod inserted. I was having problems with my thigh, so I tried your thigh wrap and it is on my thigh all winter when dressed. It comes off at night, but back on the next day when I am going outside the house. What sizes does this brace fit? What is the largest and smallest circumference this wrap will fit? It seems to be just what I've been looking for but I don't want to be disappointed. I have larger than average thighs.